A few years ago Ruth and I spent a couple of days with the remarkable Larry Rosenstock at High Tech High, and were blown away by the creativity and passion that he and his team bring to authentic learning. At that point they were just beginning to conceive the idea of a Graduate School of Education (er… run by a high school?!). Yes indeed. Now they’re flying, running the Deeper Learning conference in a few weeks, and right now, the Deeper Learning MOOC [DLMOOC] is doing a great job of bringing practitioners and researchers together, and that’s just from the perspective of someone on the edge who has only managed to replay the late night (in the UK) Hangouts and post a couple of stories. Huge thanks and congratulations to Larry, Rob Riordan and everyone else at High Tech High Grad School of Education, plus of course the other supporting organisations and funders who are making this happen. Week 7 coming up is focused on Assessing for Deeper Learning, and I’m very much looking forward to hearing from the panellists. So in this post, I’d like to share some thoughts about how we go about assessing what some of us call lifelong learning dispositions, while others refer to academic mindsets, and welcome comments from DLMOOCers and others. First, why do we want to assess mindsets? In education, assessment serves many purposes, which when confused can lead to dysfunctional assessment regimes. See the Assessment Reform Group resources for a helpful summary of this. So, the reasons for assessing shapes the forms that it should take. [p.8] “For the purposes of further discussion, this commentary simplifies current uses of assessment by clustering them in three broad categories. 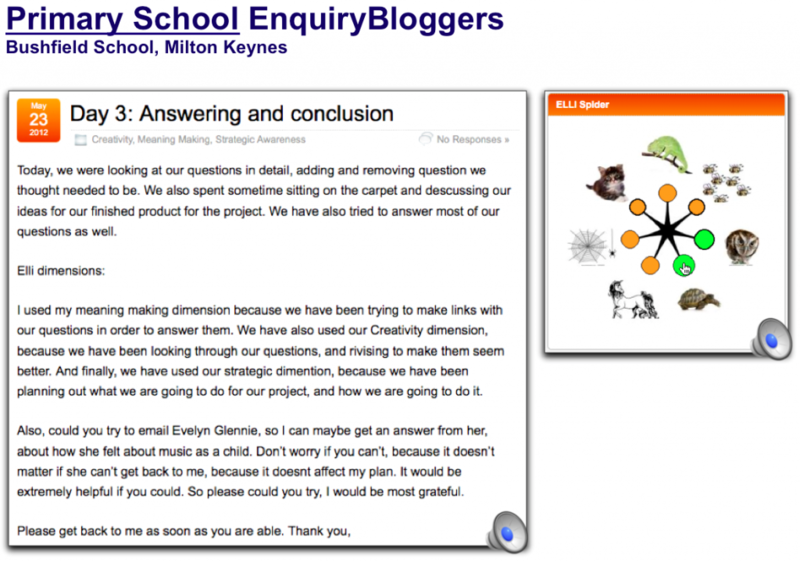 The use of assessment to help build pupils’ understanding, within day-to-day lessons. The use of assessment to provide information on pupils’ achievements to those on the outside of the pupil- teacher relationship: to parents (on the basis of in-class judgments by teachers, and test and examination results), and to further and higher education institutions and employers (through test and examination results). It might be that the goal is primarily to change teacher practice, in order to then see measurable impacts of a conventional sort (stronger engagement through increased attendance; higher grades; increased college admissions). 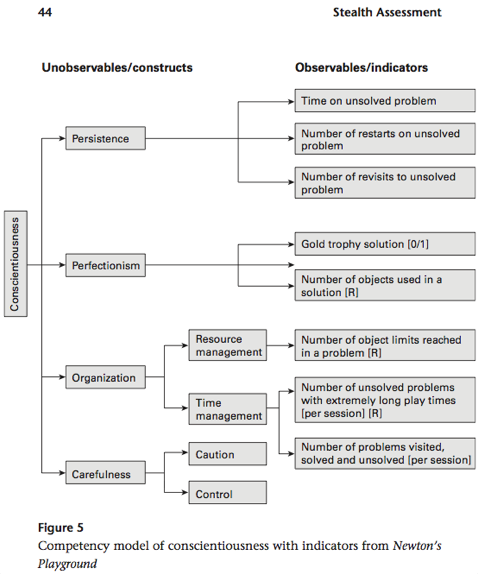 Mindsets themselves are not the object to be assessed or quantified, they are a means to better outcomes that we all agree are worthy (Types 2 and 3 above). New ideas like mindsets may need to justify themselves in terms of the current order of merit, but we should note also that they may be in tension. If learners are growing in their curiosity and creativity, they may also be less and less inclined to perform standardized tasks which have no meaning, or sit highly artificial exams. So this perhaps moves us to a deeper rationale and more transformative vision for mindset assessment. The argument for mindsets seems to me to go beyond just improving conventional outcomes, and seeks to elevate them to ‘first class’ status as a transferable, improvable set of qualities that learners will need for lifelong learning in a complex world. In education, if you can’t measure it, no-one in policy will take any notice of it as something to care about, so we need robust, evidence-based forms of assessment, and intervention strategies. This might expand mindset assessment into Type 1 above, because we want them to be an explicit object of inquiry and conversation. If we can develop rigorous, evidence-based ways to assess them, then we could help shift the mainstream educational paradigm, and associated assessment regimes dominating schools (and post-secondary/tertiary) that are constrained significantly by the need to assess only what can be measured at scale, quantitatively. That’s the 1-line version, expanded a bit in the intro movie to a Dispositional Analytics workshop we ran at Stanford last summer. 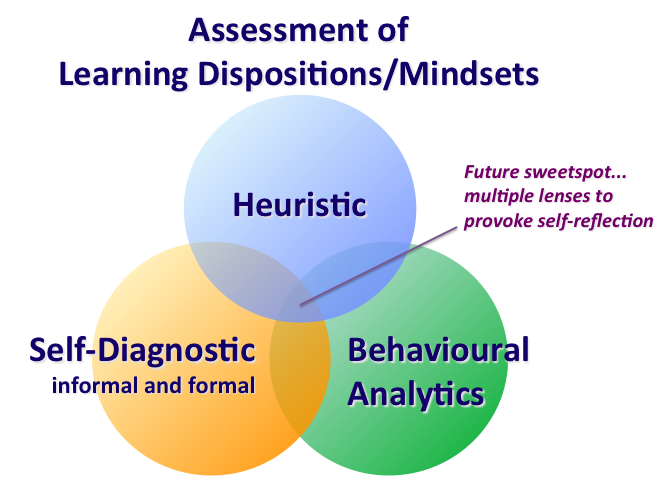 Heuristics are what we use as reflective practitioners who are learning to recognize mindsets as they manifest in learner behaviour. 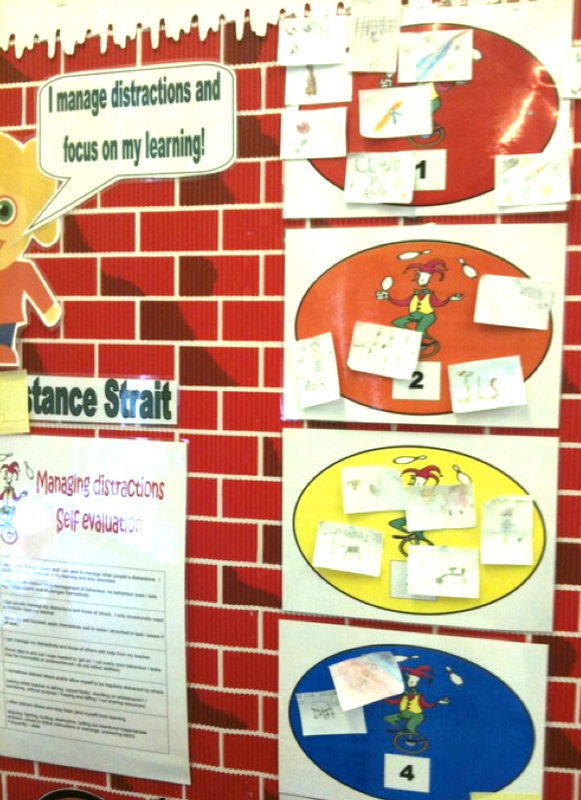 They’re situated and grounded in real life practice, and based on our developing understanding of what mindsets look like when they are displayed by a learner whom we know and interact with, in a context we know. We’ve learnt from talking with colleagues, reading articles, engaging in courses like DLMOOC, or perhaps going on more formal training in a specific approach. We may also have developed interventions to help coach them. The knowledge is a mix of personal and social, tacit and explicit, and the quality of diagnosis and intervention necessarily varies from one individual to another. It might be transformative, but it may also be patchy in quality, and critically, it’s not possible to evidence that growth very easily in objective, quantifiable terms—e.g. to sceptical colleagues, parents who question it, policymakers wondering if they should pay attention to this, or (gasp) even the learners themselves who want to know how they’re doing! Self Diagnostics are based on the premise that the learner is the world authority on how s/he experiences his or her learning, and so self-report is a legitimate window into the learner’s mind. Given the links between mindset and profoundly personal, emotional elements such as sense of identity and purpose, asking the learner how it feels for them seems a legitimate route to take. Self-Diagnostics divide into what might be termed informal and formal. …provide a representation of some sort (physical or digital) inviting the learner to express how they experience learning. A good representation externalises an interpretation of the world. The very process of designing or contributing to it can shape cognition. The affordances of a good collective representation directs the attention of the audience to emerging patterns that can then provoke reflection and conversation. 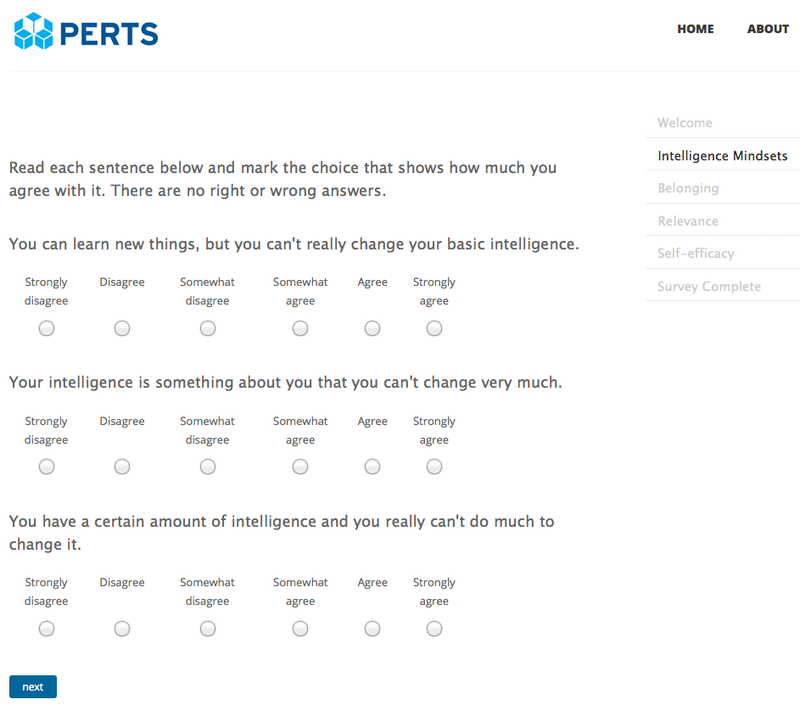 The question banks in such tools should have been validated using well established statistical and qualitative approaches used to design educational survey instruments [example]. Both PERTS Lab and the ELLI programme recognise the potential of such tools to build a large dataset [ELLI infrastructure]. Depending on the approach, the quantitative results from the respondant are then rendered and fed back to mentors, who have a repertoire of interventions to suggest in a coaching conversation. Powerfully, learners may also receive feedback of some sort, since the whole point of mindset approaches is to catalyse change in the learner’s own dispositions, and get them to take more responsibility for how they engage. 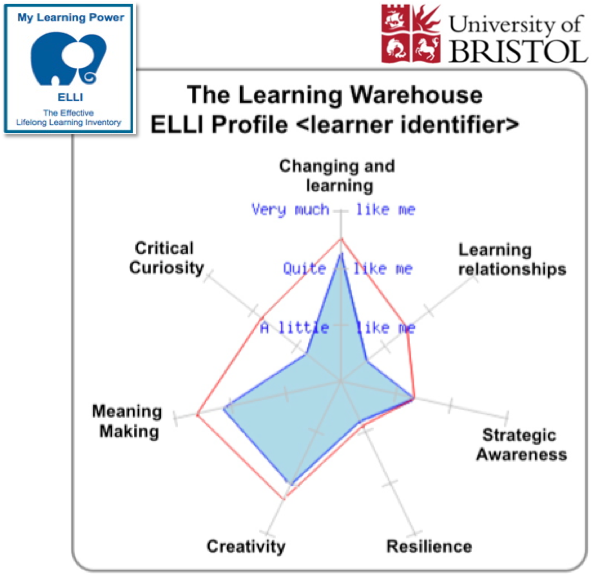 The evidence from ELLI is that immediately receiving the 7-legged visual spidergram can have a transformative effect on the learner, making visible for the first time a shape and language for talking about what were—until that point—intangible qualities. While Self Diagnostics reflect what learners say about how they behave in different learning contexts, what do they actually do in practice? 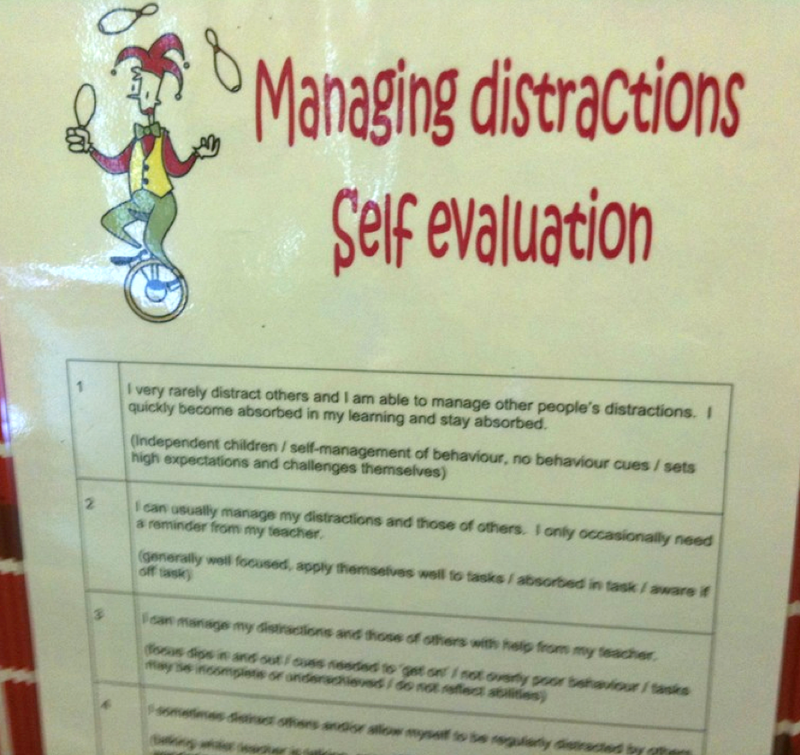 This brings us to the third approach to dispositional assessment. 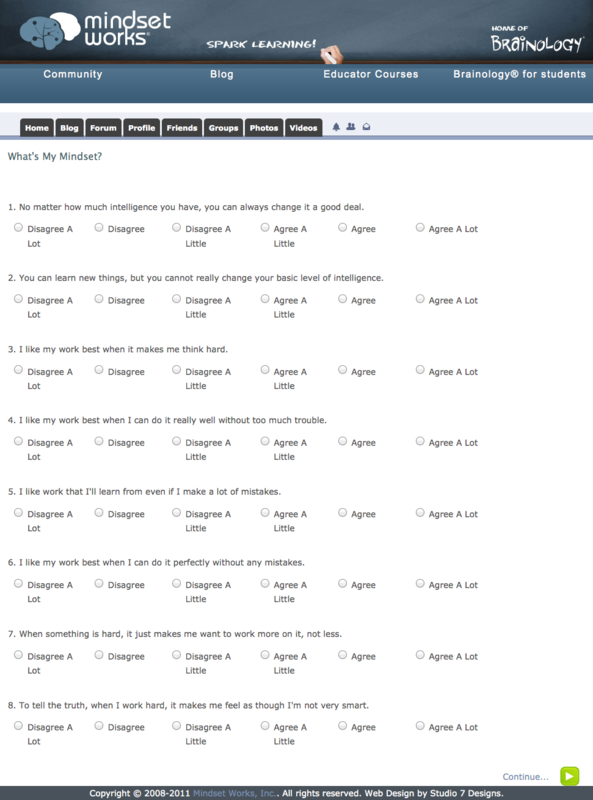 What kinds of learner behaviours can we track automatically, at scale? How do we map the contents of those low level (digital) logs to the high level personal qualities we care about in terms of mindsets? Part 2 is the tricky bit. How do we go from a behavioural trace of low level system events, to an inference that a learner is getting more resilient or curious, or starting to believe that they can get better at learning? 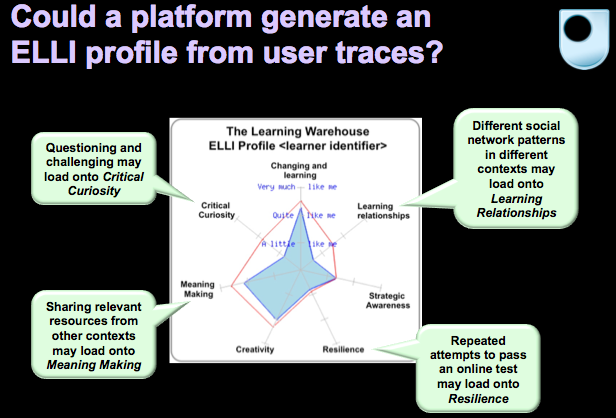 As adaptive learning platforms become available, which closely track a learner’s trajectory through a course, and mastery of the concepts in a curriculum, the possibilities grow for inferring mindsets. Appetite for a challenge can now be quantified at a high fidelity, since the platform knows what may be at the limits of a learner’s understanding. Grit or resilience can be quantified in terms of persistence. So to wrap up, these three assessment approaches each have their own strengths and weaknesses, and future work needs to explore how each can inform or enrich the others, as well as where they may differ in what they can tell us. The Venn diagram envisages that in the future, we will combine insights from the three lenses to develop an increasingly rich learner profile, which does justice to the complex, deeply personal qualities of dispositions (they have integrity as proxies for the student’s state of mind), but which can also serve as a new form of evidence-based assessment to serve the needs of the different stakeholders in the educational system (see the ARG quotes). I look forward to seeing how DLMOOCers are thinking about assessment, and whether the above framework is helpful, or lacking in important respects.